Pictured at Dublin City University’s conferring ceremony (7/11/2018) were Claudia Boucher, Abir Abbas, Zoe Berkery (centre), Kelly Bolger and Ciara Condon, all graduates of DCU Business School ranked in the top 90 Business Schools in Europe. 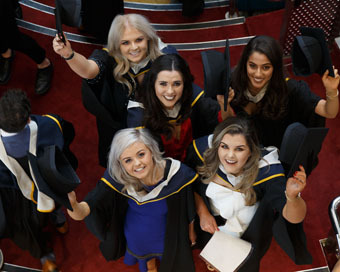 Latest statistics show that 95% of last year’s DCU graduates were in employment or further study within six months of graduation. Photograph: Fran Veale, Julien Behal Photography.